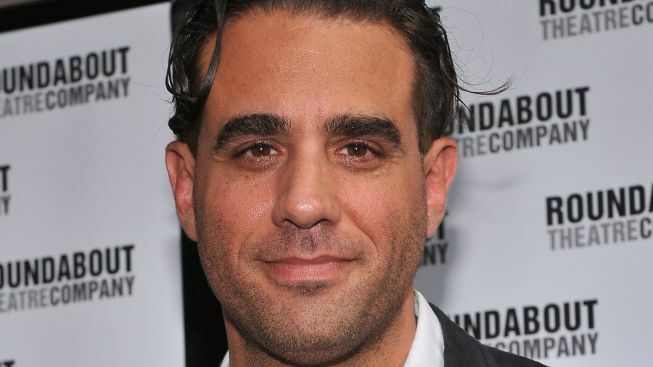 Bobby Cannavale, pictured in June, suits up as Ricky Roma in the revival of "Glengarry Glen Ross"
Office hotshot Ricky Roma is famous for his profanity-laced outbursts in “Glengarry Glen Ross,” which begins Broadway previews on Friday in a starry production headlined by Al Pacino. In a new interview with Playbill, actor Bobby Cannavale, who is suiting up to play Roma in the revival of David Mamet's Pulitzer-winning play, says the "acting out" part has always come naturally. There’s little room for sensitivity among the group of put-upon salesmen vying for their share of the American dream in Mamet’s story, set to unfold at the Gerald Schoenfeld Theatre. The drama follows a new boss in a real estate firm, who tries to edge out some of the firm’s older salesmen by giving the better leads to the younger reps. Pacino, Oscar-nominated as Roma for the ’92 film, now stars as Shelly “The Machine” Levene, the struggling salesman whose luck is about to sour. Cannavale has talked regularly about his eagerness to work with Pacino. The duo first discussed a project together when they sat side by side at last year’s Tony Awards. Later, Pacino visited Cannavale backstage after seeing him in the final performance of “The Motherf**ker With the Hat.” Says Cannavale: “I’ve pretty much spent every show I’ve ever done having this ritual where I walk to the theater, and in my head, right before I walk in, I say, ‘Al Pacino is [in the audience] tonight.’"
Cannavale’s not the only member of this new production glad to be sharing a stage with two-time Tony winner Pacino. Among the “Glengarry” stars is Richard Schiff, who played fidgety Toby Ziegler for seven seasons on “The West Wing,” making his Broadway debut. Two decades ago, Schiff did a table read with Pacino and Jack Lemmon for the film “Glengarry.” Schiff recalled the experience of watching Pacino process through that script in a new interview with Broadway.com. “He was just surfing in and out of the material: looking for what was there, what he could latch onto, what latched onto him. ... He was not concerned with any impression; he was literally just working and beginning to see what the material had in store for him,” Schiff said.